"So what did you build, anyway?" Since I've returned from my Natural Design/Build class at Yestermorrow, this question has been asked of me a number of times. Let me tell you about "The Cube." I knew that the class would be partly lecture/discussion, partly drafting and designing, and partly hands-on building, but I really didn't know how we'd go about building in Vermont, in the middle of winter. The solution: a practice building! 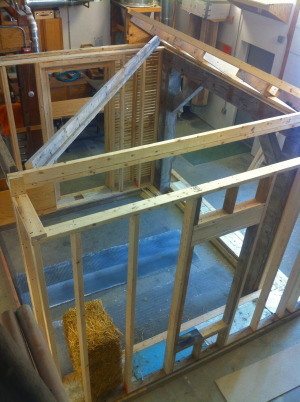 The Cube was a 10'x10' skeleton of a structure with an array of problems to solve. There were three different framing set-ups (stud, double-stud, and timber-frame), a window, a door, and a roof eave, all of which provided us with the opportunity to make and install different insulating walls (strawbale, light straw clay, and woodchip clay), to figure out how to achieve airtight seals around windows and doors, to try plastering over different substrates, and to figure out the detailing of roof eaves, window trim, and bottom wall flashing. Tacking back and forth between lectures/discussions and hours of hands-on work in The Cube created a fantastic learning environment. Each day we saw our learning become manifest in The Cube, and we would review and discuss our work as a whole class after each new skill was practiced. The vitality of this experiential style of education reminded me of the work of James Gee, one of my favorite critics of our conventional educational system. I've discussed his work before on this blog, and he's definitely worth reading if you're interested in what we know about learning. His basic argument is that our educational environments should be designed to be as compelling and engaging as video games--that teachers have a lot to learn from video game designers. In a video game, players "level up," or gain mastery over a set of skills and are then a presented with a greater degree of challenge. Leveling up builds confidence, but more importantly, keeps the player interested because as soon as they gain skills, the game gets harder. Learning is engaging and fun when you can gauge your own improvement, and when, just as you get comfortable with one thing, there's a new problem to solve. Video games also encourage trial-and-error exploration, because they have low-stakes consequences for failure (you can just choose to play again!). Exploration in this manner promotes creative approaches to problem-solving; high-stakes tests, in contrast, stimulate students to figure out what the teacher wants, to take the safe route, to memorize and regurgitate. Reviewing the lath and plaster wallGetting to play with The Cube was akin to the learning environments created in good video games. The consequences were fairly low, so we felt free to experiment--in one of the walls, we varied the proportion of straw to clay, to see how that would affect the strength and mass of the wall. And our learning was "scaffolded"--we learned one thing, practiced it in The Cube, and then were introduced to a more complicated aspect of it. By "leveling up," we gained familiarity with the basic workings of the structure, and were not overwhelmed by the more complex problems. Greater complexity was presented to us, but only after we'd grown in skill and confidence, and had the tools to begin to think about the new challenge. I think if I'd been presented early on with the three types of roof eave/wall transitions, I might have wondered if I was really up to the task. But by the time we got there, I'd already accomplished a number of new and challenging things, and was learning to say to myself: "Well, let me see...how can I figure this out..."
And this brings me to what I loved most about this introduction to natural design/building: the realization that it's all about problem-solving. Well, perhaps that's a stretch--it's also about beauty, and social justice, and the creative impulse, and community, and being in tune with Earth. But the primary cognitive and creative activity of designing and building, I realized, was that of problem-solving, or puzzling. Design/building means understanding a situation, having a vision, and then figuring out how to realize that vision as fully as possible. Sometimes the questions seemed mundane--how can you make a flat plane when you have an uneven substrate? How can you make an unruly substance fit into an angular, tight space? Can you create a clean angle in a strawbale without breaking the bands? But then other puzzles were complex and multi-faceted: what are the pros and cons of building with this material in this particular situation? If we construct a wall in this way, what kind of transitions are possible between the roof and the wall, and what does that mean for insulation, sunlight, or rain splash? The design portion of the class gave us an embodied understanding of the value of iteration--of drafting, solving problems, discovering problems, and starting again, refining and refining until the various, interconnected, sometimes invisible problems or puzzles have all been solved. I suppose you could say that there was a kind of learning iteration, that went between the discussion table and The Cube, because a problem that seemed intractable in theory would become clear in practice, and vice versa. The embodied learning that took place in The Cube was valuable to me in multiple ways: it gave me a better understanding of the physical puzzles to be solved, an appreciation of the complexity and art and history of structures, and it also enabled me see myself as a builder. James Gee, and many others, talk about the importance of embodied learning--that learning is most likely to occur when the subject matter is not abstract, divorced from concrete experience, or outside of what a person can imagine him or herself doing. In The Cube, I learned about how plaster sticks to straw, and how it can fall off hanging metal lath, how it can easily fall to the floor, or be marred by the trowel if you turn suddenly...And I learned the pleasure of making a smooth plane, of trial and error and the discovery of solutions, and the wonderful ache of my arms.